The Barrel Cam Indexer SD Series are one of the ideal mechanical solutions for dial application in diverse industries in driving a linage or inline conveyor. These are fabricated in cast iron alloy body, that guarantees a smooth and hassle free operation. Available with us is a wide range in this product that is manufactured as per the technical details provided by the clients. We offer barrel cam indexers at best industry prices. Our range of technically superior Barrel Cam Indexers is best suited for Dial application such as driving a linage or inline conveyor. These have a string and robust rigid housing design and stable bearing arrangement that guarantee a smooth vibration free motion. Further, the unit is also capable of high positional accuracies due to the large PCD of the Roller followers but more suited for slower speeds with large mass movement. The Barrel Cam Indexers available with us are CNC Cam profile milled and hardened thereby ensuring High Load capacity and Oil Bath Lubrication. Fabricated in cast iron alloy body, these ensure maximum station – to – station accuracy double extended Input Shaft. Barrel Cam Indexers can be fitted with Reducer and Drive through hole Output and Shaft can be provided. These are an ideal option for dial application and ensure hassle free vibration devoid motion. Further, the CNC Cam Profile Milled and Hardened ensures High Load capacity and makes the product even more rugged to withstand harsh conditions. We offer Barrel Cam Indexers in cast iron alloy body that are best applied for Dial application such as driving a linage or inline conveyor. This unit is capable of high positional accuracies due to the large PCD of the Roller followers but more suited for slower speeds with large mass movement. Owing to our technical proficiency in the company, we have come up with a range of Barrel cam Indexing in different series. The rigid housing design of the system along with the stable bearing arrangement ensures a smooth and hassle free vibration devoid free motion. Further, the large PCD of the roller followers ensures high positional accuracies but make it ideal for slower speeds with large mass movement. Barrel Cam Indexing is a technically superior product available with us, which finds application in diverse industries owing to its robust design and performance. One of the most ideal solutions for Dial application such as driving a linage or inline conveyor, these ensure smooth and hassle free operation. 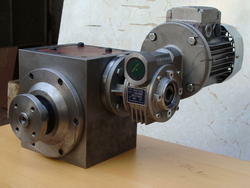 The technically sound Barrel Cam Indexers are best suite for Dial application like driving a linage or inline conveyor. These are made available with the rigid housing design that ensures its durability for a longer period of time. Further, a stable bearing arrangement ensures a smooth vibration free motion. Looking for Barrel Cam Indexer for Packaging machines ?